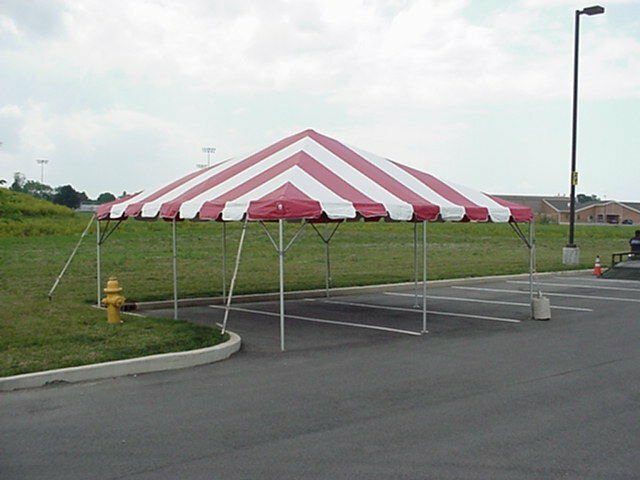 Frame tents are used on surfaces that cannot easily be staked into the ground, such as concrete, tile, and some asphalt. The frame tent does not have any poles in the interior of the tent, using a strong metal frame to support the weight of the tent. There are metal poles around the perimeter of the tent, often secured on the corners or other strategic points by ropes that are tied to stakes that are driven into the ground, or sometimes held by concrete weights. Frame tents allow for maximum capacity inside the tent, as there are no interior poles. Many venues prefer frame tents, as the need to drive stakes into the ground is minimal. Click here for sizes and capacity details for frame tents, or click here for frame tent photos.